Most cyclical indicators suggest that the U.S. economy is in the middle of what could be the longest economic expansion in U.S. history. 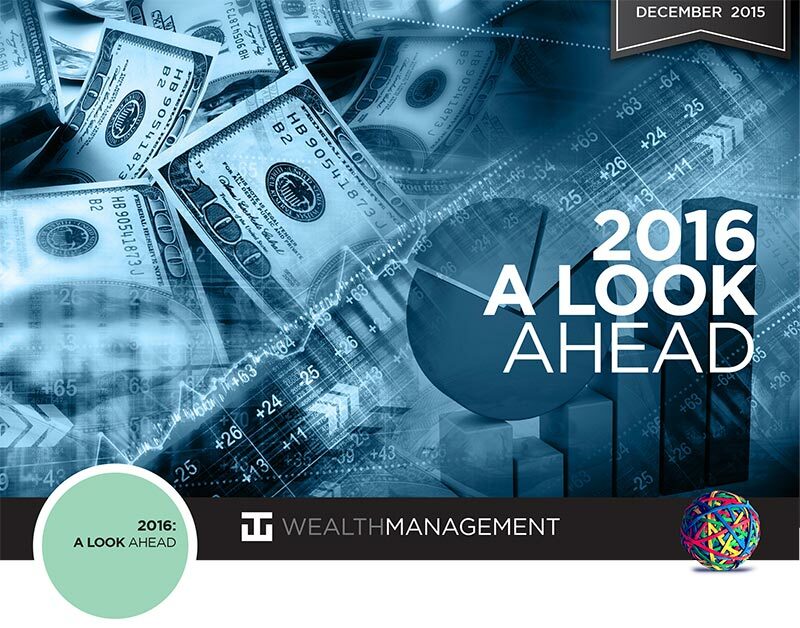 While WT Wealth Management remains cautiously optimistic about 2016, history has proven that after the Federal Reserve tightens interest rates there is a period of increased volatility in the financial markets. However, when reviewing past tightening cycles we found that 6 to 12 months after the first rate increase the equity markets are generally higher. Remember, higher interest rates tend to imply a stronger and healthier economy which is good news for equities. The last recession ended in June 2009. Almost six and a half years later, the usual measures of the cyclical timing clock are clustered around the mid-cycle position in the economic recovery process. The measurables that most experts use to determine that include moderate GDP growth, low inflation, the move to normalize rates and heightened volatility in the financial markets are all mid-economic cycle traits. (See Graph 2). In addition, many of the economic leading indicators we monitor point to continued moderate economic growth going into 2016. After a soft patch during the summer of 2015, leading indicators rebounded and posted a big gains in October. Leading Indicators have grown more slowly over the past year following a sharp acceleration in 2013 and 2014. This is no surprise, we are deeper into the recovery and investors should expect more tepid economic improvement as the recovery continues. On numerous occasions we have said, this is a plow horse economy, not a race horse economy. In our opinion, much of the mid-year deceleration in 2015 is attributed to the drag from lower oil prices on the energy sector, the strong dollar effect on exports and the currency effect on earnings of US multi-nationals. Together, these effects have been disproportionately harmful to the manufacturing sector, where factory production growth has slowed from about a 4% pace, when energy was normalized, to just about a 2% pace over the last year. Generally, the mid-cycle economic blues have been exaggerated by an overemphasis on manufacturing and goods production data and an under emphasis on the services sector. While the former has slowed in the U.S. and the world, the latter has picked up. Since services account for the vast majority of GDP growth, (see Graph 3) it has held up despite the widespread view that it has slowed down. The slowdown view has also been fed by falling commodity prices and the strong U.S. currency, which makes nominal growth lower in dollar terms even when real growth is rising. Most importantly, in our opinion, one of the ten components in the index of leading economic indicators is the yield curve spread. This is the difference between the 10-year Treasury note yield and the overnight federal funds rate which is set by the Federal Reserve’s policy making committee. Over time, this measure has shown the best track record of any single leading indicator for predicting recessions and tracking the current level of monetary policy accommodation. The yield curve spread is currently around 200 basis points. That spread is extremely accommodative and implies monetary policy is still in an early expansion phase position. Mid-cycle positioning for the yield curve is in the 100 to 150 basis point range. This is an important reason for expecting several more years of expansion. The following chart is very powerful. (Graph 4) Every recession in the past 50 years has been preceded by an inverted yield curve after the Federal Reserve raised the short-term rate above the ten-year yield. 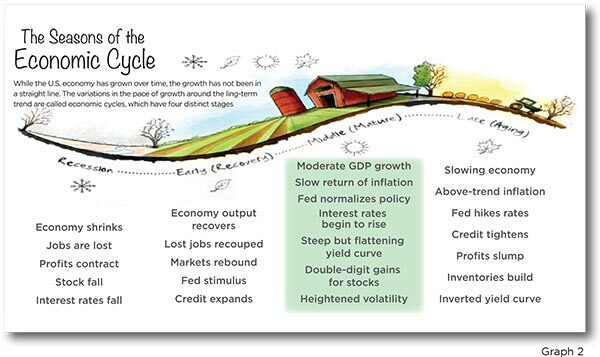 Monetary policy is one of the main drivers of the business cycle and currently it’s on cruise control. A few rate hikes over the next year are unlikely to put the brakes on. In fact, the last thing the Fed wants is to put the brakes on. We have every reason to believe they will be dovish at every opportunity when evaluating economic data. Generally the Fed stays accommodative to foster economic growth until inflation becomes a problem. One reason this is such a long expansion is the unprecedented level of low inflation, the lowest in over a half century. In fact, the Fed is in the unusual position of wanting more inflation. When the Fed is accommodative, the use of leverage or debt becomes more prevalent. In fact, one reason expansions turn into recessions is the excessive use of debt to keep growth going becomes unrealistic. Experts look at the ratio of borrowing for consumer durables, houses and business investment relative to the value of the assets financed. As borrowing gets higher relative to a unit of these demand items in GDP, the ratio rises. Reviewing history, we feel the leverage ratio shows a clear cyclical pattern. It plunges in recessions, when everyone pulls spending and reduces household debt. Leverage then recovers over the expansion as everyone moves onto the dance floor. By the end of an expansion period, each unit of GDP growth requires too much borrowing to be sustainable and a recession ensues. The 2008–2009 financial crisis was the most extreme since the Depression. The subsequent liquidation of debt during and after the Great Recession is now giving way to more normal borrowing by consumers and businesses. While credit growth has normalized, most feel households are in good shape to borrow. 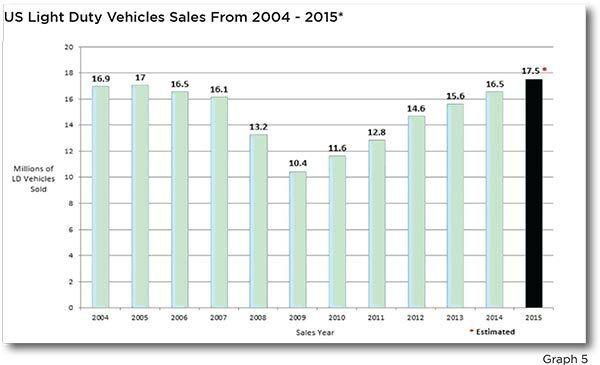 We believe this is one reason auto sales have been so strong over the last several years. Many feel consumers have a lot of room to party in the future as wage gains improve, job growth continues, low unemployment stays in place and easing credit conditions support big-ticket purchases like homes and autos. 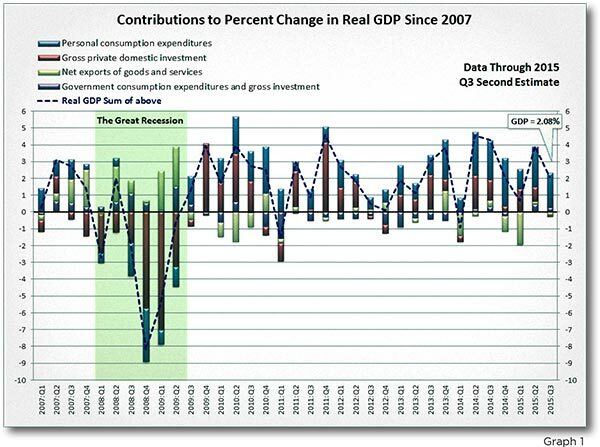 Personal consumption accounts for about 70% of U.S. GDP. Low oil prices and a strong dollar are major tailwinds for consumers to continue spending at the three-percent-plus real growth rate the FOMC policy statement deemed “a solid projection” on October 28, 2015. We feel healthier personal finances and a strong labor market should bring additional pent-up housing demand to fruition. This is the first time in the past 75 years that housing did not help lead the recovery. We feel it’s a result of being at the epicenter of the debt binge that created the financial crisis in 2008-09. In essence, housing sailed through the 2001 recession, giving it 15 years to accumulate excesses that culminated in the biggest crash since the 1930s. Easy credit, creative financing and home owners withdrawing equity out of their homes like an ATM machine didn’t help the cause either. Housing momentum tends to peak before recession. Many experts feel we are in the early days in the housing recovery cycle. Its mid-cycle peak is several years away. Millennials are just starting to buy houses and move into apartments on a grander scale, after retreating into family homes, apartment and even roommate situations over the past several years. Household formation was extremely depressed during the first five years of this current expansion. It has improved considerably in the past year to about 1.5 million, double the depressed prior rate and more in line with current demographics. This implies residential investment will continue to grow by roughly 10% for several more years. 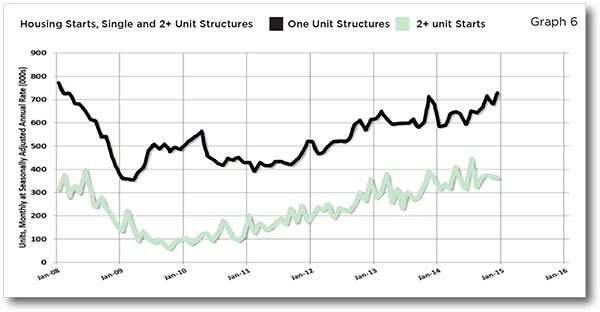 Housing starts need to rise at least 35% to get back to normal. It’s possible the housing expansion could run through a mild recession as the 1991–2007 housing cycle did. If inflation were to press the Fed to tighten and invert the yield curve, other parts of the economy could slow enough to cause a recession, as happened in 2001, without too much impact on housing and consumers. Inflation is the usual cause of recessions. It requires rising wages. Without rising wages consumers cannot pay higher prices. Low inflation has its draw backs. Unfortunately it has been associated with the lowest wage growth in nearly half a century. Because inflation is even low, real wage growth has actually been relatively high by the standards of the past 45 years. Still, there is a cycle in wages, and they bottomed three years ago and have been drifting erratically higher since, albeit very slowly. Wages have risen about 2.5% over the past year. At 5%, the unemployment rate is half its peak value of five years ago. It is likely to fall below 4 % over the next year according to many economists. A wide array of indicators point to the slow start of rising wage pressures. Initial reports are just starting to reference jobs that are being unfilled due to lack of candidates. Many forecasts suggest it will take another three to five years for wage inflation to rise above the 3-4% threshold that capped the past three business cycles. Employers just do not have to pay employees more to keep them. 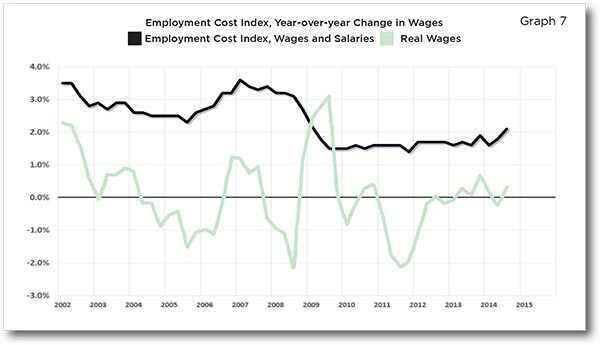 For now, wage pressures are showing typical mid-cycle behavior. Because wages are rising from such a low level, earnings gains are likely to run higher for quite a while as the Fed has made it clear that it is more willing to let inflation drift higher than its 2% target for a while rather than risk having it fall short. HISTORY HAS SHOWN OVER AND OVER AGAIN: DON’T FIGHT THE FED! Consumer confidence reflects the strongest labor market in many years and solid real wage gains in a low inflation environment is good for everyone. The so-called “misery index”—inflation plus the unemployment rate—is at the lowest level since the mid-1960s. Surprisingly, by that measure, this is the best economy in almost 50 years. Consumers are well past midcycle levels of confidence which is an encouraging sign. Currently, economic times are good enough that expectations are below current conditions. Americans, for the most part, are not living beyond their means. The expansion in the 1990s is the longest on record. We believe the current expansion may surpass it because people are generally more risk averse and it will take a while longer, in our view, for excessive enthusiasm to develop as it did between 1995 and 2000 and 2003 and 2007. On balance, consumer confidence has a ways to go before it becomes bubbly in our opinion. Profits are another determinant of the business cycle. Margins tend to peak around mid-cycle, having recovered from the cyclical low point at the end of the recession. Then, profits decline as a tightening labor market erodes profits. This year, profits have stalled, causing the recession prognosticators to come out of the woodwork despite all the evidence to the contrary. They have been faked out by the impact of the strong dollar on foreign earnings and the low oil price on energy companies’ profits. Underneath those effects are mid-single-digit earnings growth and very high margins. The primary cyclical erosion of margins comes from rising wages, since labor is the biggest share of business costs. While cyclical pressures are likely to erode margins during the second half of this cycle, our forecasts anticipate they will remain very high. Labor is a much smaller share of the modern output mix so modest gains in wages inflation will exert less margin pressure than in the past. Old economy brick-and-mortar retailers, for example, have a much higher labor cost share than new economy retailers with many fewer employees per dollar of sales. That distinction illustrates the relative performance difference that is shaping up for the second half of the cycle. This has been a stronger-thanaverage profits expansion. It should continue, just at a slower pace. Another reason for the mid-cycle blues is the 2015 stall in earnings. Similar mid-cycle earnings stalls occurred in the 1980s and the 1990s when a strong dollar and low oil prices temporarily hit profits. In both cases, the economy went on to post the longest expansions in U.S. history, expansions that resulted in strong equity market returns. The phrase “the pause that refreshes” was common then and seems appropriate now under similar conditions. This is more of an observation than prediction as the world is much less settled place with tensions in the Middle East, economic struggles in Europe, Global Terrorism and a Presidential Election looming at the end of 2016. In short, in our opinion, it’s hard to find indicators that suggest the U.S. expansion is on its last legs. Pockets of distress in energy and commodities markets are too small to derail the expansion in most expert’s opinions. In fact, their loss is the economy’s gain, as we’ve seen in the robust consumer sector. Deal-making leverage has come under scrutiny as low interest rates relative to returns on equity are too attractive to resist, causing a re-leveraging of corporate America. We continue to expect U.S. equities to outperform fixed income in the coming year although it could be a very bumpy ride. Fixed income has the headwind of higher rates while equities should benefit from the many tailwinds outlined in this paper. Economic indicators suggest that it’s too early for a cyclical bear market in our opinion. Most signs point that equities should remain on a longer-term uptrend as the U.S. and global expansions continue. AT WT Wealth Management we feel the markets will continue to be led by new economy players; technology, on-line retailers and Millennial driven industries while old economy players, brick and motor and aging baby boomer plays could potentially lag. We reaffirm our mid-cycle economic expansion phase view and continue to expect equities to outperform other asset classes but with more volatility than in recent years. At current prices, we expect non-U.S.- developed equities to outperform those from the U.S., as the potential relative increase in growth versus expectations is more pronounced overseas along with lower interest rates and more conducive monetary policies. However, international markets pose additional risks and we feel there are too many uncertainties to overweight international equities in most investor portfolios. We continue our “get-paid-to-wait” strategy across U.S. equities and continue to lower the overall beta in portfolios by allocating to lower-volatility investments and strategies where available. We maintain our cautious views in regards to energy, materials and industrial sectors which are typically mid and late cycle leaders. We still advocate our affinity to low beta and recession safety plays like consumer staples, healthcare and even utilities and balance that stance with growth exposure to financials, industry leading technology companies and selective consumer discretionary plays. It’s important to note, we understand the importance of the energy & industrial sectors on the US economy but feel their general dependency on low interest rates, global sales and the strong dollar impact on earnings require an underweight, rather than a traditional overweight that accompanies a late recovery play in these two sectors. U.S. Largecaps and Midcaps are at an overweight for WT Wealth Management, given our stance that the U.S. is the engine of world growth, and stronger consumer trends are gathering momentum as real incomes rise. Downward revisions to earnings in the energy, materials and industrials sectors caused us to reduce our S&P earnings outlook for 2015 to $118 – $122 and to reduce our target for the S&P 500 to 2,150 for year-end 2015. In 2016, we expect earnings to grow normally and hit the $128 – $130 range on the S&P with a year-end S&P 500 target of 2,250 as we also believe we can potentially see a multiple expansion to 17.5 as investors pay more for the safety and quality of U.S. earnings compared to other alternatives around the globe. We do not expect a measured tightening of short-term U.S. interest rates to stall the equity market’s advance. The Federal Reserve will clearly be data dependent in 2016 and we believe they will error on the side of caution at every opportunity. Low energy and commodity prices, plus the strength in U.S. employment, should continue to underpin real incomes and stimulate consumer spending and overall US growth. This should outweigh the drag on exports from the stronger dollar. We remain underweight in emerging market equities. China’s structural growth slowdown, low commodity prices and the start of interest rate increases by the Federal Reserve mean that the current global economic environment remains adverse for many emerging markets, and we remain selective in the asset class. Volatility is likely to stay elevated as risk and rebalancing continue to be repriced, and despite today’s low valuations, we see ongoing risk of further downside for prices. We feel Emerging Markets are only appropriate for long-term, 5-7 years, investors with high tolerance for volatility. We maintain our marketweight in international developed equities. Japanese equities should enjoy tailwinds from faster global growth and continued efforts to end deflation. Europe’s recovery is broadening, and it should benefit from higher risk appetites as quantitative easing (QE) gathers momentum. The European Central Bank’s (ECB) open-ended QE program should support continued improvement in the equity environment in Europe. We maintain neutral weightings with both Japanese and European equities and feel generally, the risk are worth the rewards. The more conducive monetary policy in Europe can only help the cause. We remain overweight’s in Technology, Consumer Staples, Financials and Healthcare as we expect these sectors to benefit from general demographics of U.S. consumers, a steeper yield curve and there earnings will be effected less from the strong U.S. dollar. Healthcare does deserved to be watched in the future as a change in the Presidency could change the current the lack of political unity or conviction to repeal Affordable Healthcare. We believe energy is at historically low relative valuation levels and feel market weighting would be appropriate for investors that can patiently wait several years for oil to recover and can stomach the volatility and potential dividend cuts that will affect the sector and rock valuations. Otherwise, in the shorter term, we feel with global demand diminishing and global supplies increasing it warrants an underweight. We also remain underweighting positions in materials (general lack of demand and deflationary pressures) and industrials (strong dollar). We also retain our market weights in utilities, telecommunications and consumer discretionary sectors. We remain committed to a traditional asset allocation weighting to fixed income. We are committed to maintain a neutral to slight overweight to lower volatile asset classes like fixed income. We feel no more than 2-3 rate increases (50-75 bps) are in play for 2016 and continue to like their low price movements compared to other investments. We continue to like treasuries –less than 10 years-, high quality corporate bonds and municipals. In the current higher volatility market, some allocation to Treasuries for liquidity and relative safety is advised for nearly all investors. We have been early allocating to floating rate/ senior secure loans but believe their lack of recent performance is a fair trade off because of their low volatility and correlation to the equity markets and above average yield characteristics. We remain neutral in real estate as an asset class. Outperformance by real estate investment trusts (REITs) over the last few years has stretched valuations, but the recent sell-off in the asset class has made yields very compelling in our opinion. We would continue to allocate to non-recessionary sector properties like hospitals, long-term care facilities, office and medical buildings but would remain cautious about shopping and strip malls and residential REITs. The dollar. The U.S. dollar has become more fully valued but it is not done rising: there are still enough domestic and external forces in its favor even as it pauses to digest the strong appreciation it experienced over the last year. Though not the only driver, monetary policy/major central bank balance sheet dynamics should remain a major force behind likely further dollar appreciation against both major and emerging market currencies. In 2015, the markets were irrational, unpredictable, subject to the push and pull of every news story and generally more volatile than in recent years. The ominous reality of higher interest rates took a toll on fixed income and equity markets. It’s important to meet with your financial professional more often during these volatile market periods. We need to know and understand your propensity for risk and your general feelings about the markets and your accounts performance. In many cases account values have been flat over the past year but you can’t make oil out of water. 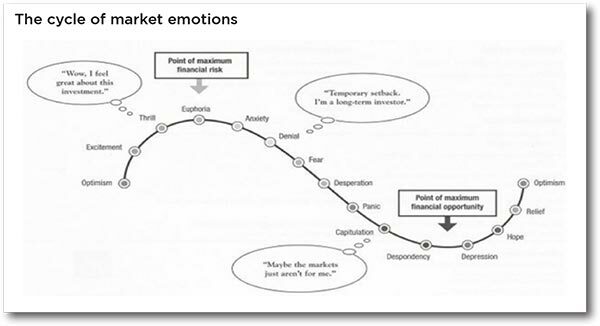 I thought I would end this paper with a graph of the human and market emotions as many times it’s darkest before dawn. We encourage investors to remain cautious but optimistic and not to react quickly at the moment a news story is breaking. In the past 16 months we have seen two selloffs of 10% or more only to see full recovery in less than 45 days. At WT Wealth Management we are 100% fully committed to being fully invested, you don’t pay us to manage cash. To make money in the financial markets takes time and in many cases missing the best month or two can seriously effect the overall performance of your account. One great month can be the make or break period for the entire year. It’s time in the market and not market timing that bring results. Our style is about managing risk and not taking chances. You ask what the difference is. Easy, risk can be managed and measured and chance is just that, chance. A copy of WT Wealth Management’s current written disclosure statement discussing WT Wealth Management’s business operations, services, and fees is available at the SEC’s investment adviser public information website – www.adviserinfo.sec.gov or from WT Wealth Management upon written request. WT Wealth Management does not make any representations or warranties as to the accuracy, timeliness, suitability, completeness, or relevance of any information prepared by any unaffiliated third party, whether linked to WT Wealth Management’s web site or incorporated herein, and takes no responsibility therefor. All such information is provided solely for convenience purposes only and all users thereof should be guided accordingly.